Cake Master Duff Goldman weighs in on the sugar debate, arguing that – while sweets are fine in moderation – many Americans lack the willpower not to overindulge. Larry King: You’re in a business that is being knocked around across the country, the word is “sugar.” The number one selling book is anti-sugar, sugar is a menace, sugar is a killer. You depend on sugar, do you not? Duff Goldman: I do, I do, yeah. Larry King: How do you respond to this attack? 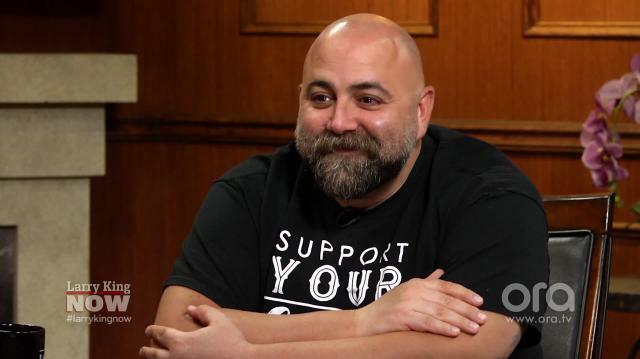 Duff Goldman: I would say, listen, I think everything in moderation. People, you’re not supposed to eat a ton of sugar. If you ate all six of these cookies, I’d be worried about you. Have one cookie. Larry King: That won’t hurt you. Duff Goldman: It’s not going to hurt you. Larry King: A piece of layer cake. Duff Goldman: It’s okay. Don’t eat the whole cake. I think the problem is, as Americans, we don’t have any willpower. Larry King: You can’t bake without it, right? Duff Goldman: No. I mean, you can, of course you can, but sugar-free stuff is tough because most of the stuff you have out there right now still kind of leaves a bad taste in your mouth. I would rather eat raw, I would rather have apples. Larry King: What about fake sugar? Duff Goldman: It’s fake, it’s a chemical, and it’s got a long name, and I don’t want to eat that. Larry King: But it’ll taste sweet, won’t it? Duff Goldman: I mean it’ll taste sweet-ish. You can’t fool your taste buds. If it’s sugar, you’ll taste it. If it’s not sugar, you’ll taste it. And that’s not just somebody like me who has a pretty well-trained palate, that’s anybody. Larry King: So you won’t cook with Splenda? Duff Goldman: I mean if I have to, if somebody really wants me to do it, I will, but I don’t like to.